U.S. Commercial Boiler Market size in 2017 was over USD 3,000 million and the annual installation is set to exceed 80,000 units by 2024. U.S. commercial boiler market is set to witness strong growth subject to stringent federal regulations to limit greenhouse gas emissions from commercial establishments and investments toward replacement of traditional heating systems. The federal government in collaboration with the state agencies has undertaken a range of measurers to address rising environmental pollution. For instance, National Emission Standards for Hazardous Air Pollutants (NESHAP) introduced by the U.S. Environmental Protection Agency aims to regulate carbon emissions across commercial and industrial centers. Government focus toward improvement of healthcare facilities coupled with investment toward retrofitting of educational establishments will propel the commercial boiler market growth. For instance, in 2016 the healthcare expenditure in the U.S. was valued over USD 3 trillion, accounting for over 17% of the overall GDP. Rising need for space and water heating across cold climatic regions along with demand for the energy efficient heating technologies will enhance the market size. Ongoing spending toward development of commercial centers will further boost the product demand. For instance, over 28,000 commercial buildings were constructed across the country from 2008 to 2012. Gas fired commercial boiler market revenue is set to exceed USD 3 billion by 2024. High efficiency, low emission rates and robust gas infrastructure are some of the dominant factors which will boost the product demand. Natural gas is one of the primary fuel consumed across commercial sector with over 3,177,099 million cubic feet consumed in 2017. Oil fired commercial boiler demand will witness gains over 2% by 2024. 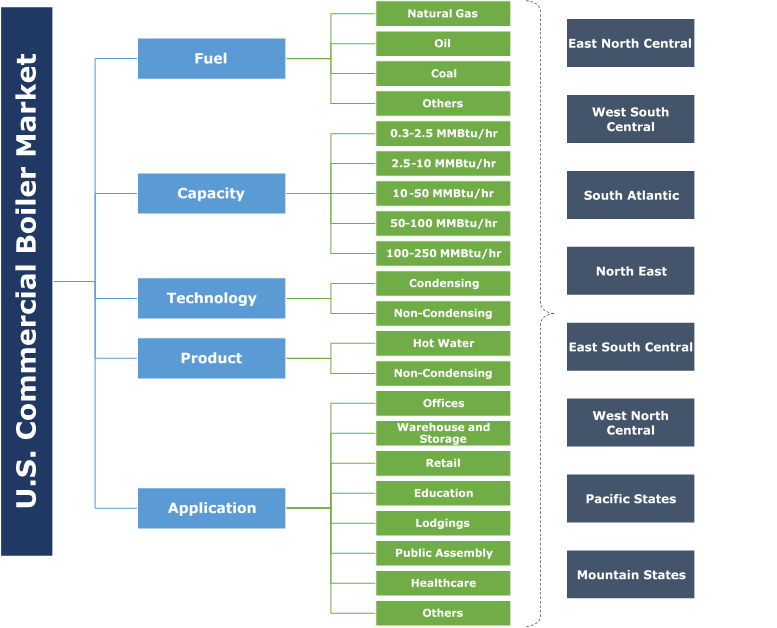 Government measures to promote energy efficient technologies along with focus toward reducing dependency on conventional fuels will limit the product adoption. High carbon content in flue gasses coupled with comparatively low efficiency may further restraint the demand for these products. U.S. commercial boiler market from healthcare is anticipated to witness strong growth on account of rising steam and hot water demand for space heating and equipment sterilization. Growing federal spending towards modernization and expansion of healthcare facilities will further propel the business growth. For instance, as per the Centers for Medicare & Medicaid Services (CMS), healthcare spending in the U.S. witnessed a growth of 4.3% in 2016 amounting for over USD 10,000 per person. Office application in 2017 was valued over USD 700 million. Growing adoption of green buildings coupled with robust infrastructure development will boost the product demand. Rising investment toward development of new commercial centers across major cities will further enhance the business landscape. Commercial boiler market from 0.3-2.5 MMBtu/hr capacity is projected to exceed USD 500 million by 2024. Ease of installation along with its cost effectiveness over available alternatives will drive the business growth in coming years. These products find wide applications across retail stores, offices, educational & healthcare facilities, public assemblies and lodgings. 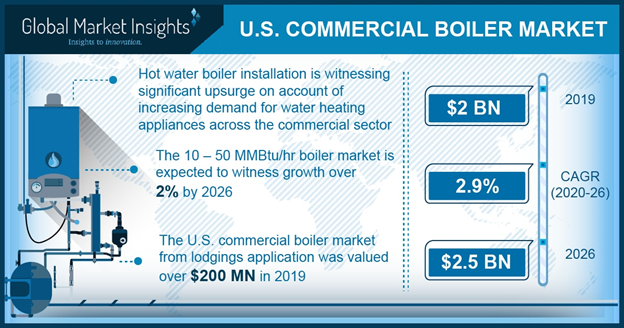 U.S. commercial boiler market from 2.5-10 MMBtu/hr is set to witness gains over 1% by 2024. Expansion and modernization of commercial centers along with shift towards high efficiency condensing boilers will drive the demand for these products. Robust growth across service sector including hospitality and retail will further enhance the industry landscape. Stringent regulations toward carbon emission from commercial establishment along with rising consumer awareness towards high efficiency heating systems will drive the demand for condensing boiler systems. Its ability to provide high efficiency and contribution towards fuel savings will further propel the business growth. Low cost and ability to withstand wide ranging weather conditions are some of the key underlying factors which will drive the non-condensing commercial boiler market growth. Minimal maintenance cost, compact size along with ease of installation will further fuel the industry growth. Texas, in 2017 accounted for over 50% of the West South Central commercial boiler market revenue. Presence of prominent commercial centers along with positive outlook towards healthcare sector will drive the business growth over the forecast period. Florida commercial boiler market is set to exceed 1,500 unit installations by 2024. Growing spending towards upgradation of hospitals along with positive outlook towards tourism sector will drive the business growth. Florida is one of the largest tourism centers in the U.S. accounting for over USD 80 billion spending in the year 2014. Key participants across the market include Fulton, Cleaver-Brooks, Parker, Burnham, PB Heat, Bradford White, A.O. Smith, Weil-McLain, Miura, Babcock and Wilcox, Victory Energy, Northwest Manufacturing, Precision Boilers, P.M. Lattner, Rite Engineering, Johnston, Hurst Boiler, Columbia Boiler, Superior Boiler, Groupe Simoneau, RBI, Clayton and Vapor Power. The industry over the years has witnessed turnaround on account of resurgent commercial sector growth post 2008 recession. Major industry players are focusing toward product enhancements and efficiency improvement to maintain a competitive edge and meet the changing regulatory requirements. Boilers are enclosed vessels predominantly deployed for the hot water and steam generation and are primarily fueled by oil or natural gas. These products find wide ranging application across various commercial sectors including institutions, offices, lodgings, retail stores and healthcare facilities.